Home > Staff Issues > What Benefits Should You Offer Your Waiting Staff? There is a fine balance between giving your restaurant staff appealing benefits in order to foster loyalty and a positive working atmosphere, and giving away your profits. There are five key areas of benefits to give your waiting staff and you will need to decide which ones are most suited to your employees. If, for example, the majority of your waiting staff are students that come and go each year, you do not need to develop long-term loyalty, but to make them as positive as possible during their season with you, whereas if you have local people working for you that could potentially stay for many years, you need to look at their long-term development and happiness. While you may not want to encourage drinking alcohol on duty, it is important to offer your staff free drinks – this really is the minimum benefit. You don’t have to offer unlimited access to your expensive bottled fruit juices or posh coffees, but water and soft drinks are fine. When on a shift that lasts for more than five hours, you ought to offer your waiting staff a free meal. You don’t have to let them pick from the a la carte menu, but the day’s special or a specific meal is fine. Many restaurants and hotels ask the chef to prepare a particular dish for the staff if there are a large number of workers – something like a pasta bake or a stew is easy and cheap to make in large quantities – and then encourage the staff to eat before customers start to arrive for lunch or dinner. The reason that you see so many waiting staff wearing black skirt or trousers with a white top or shirt isn’t just because it’s practical and helps customers recognise who the waiters and waitresses are; it’s also something that most people have in their wardrobe. There is no reason to offer free cleaning of these clothes. The only time it is necessary to offer cleaning of waiting staff clothes is if you ask them to wear a particular uniform that you provide. You cannot ask them to buy their own uniform, either. 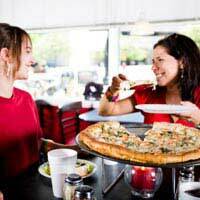 This is a popular benefit to offer your waiting staff, but it can easily get out of hand. It’s one thing to encourage the cool kids to come in by giving your waiting staff the ability to cut the bills of their friends (only paying for drinks and giving food free or reduced by 50% is popular) but it’s quite another to have people getting drunk on your profits. You need to encourage your staff to use any friends and family discount wisely and make it clear that you can withdraw this privilege at any time. If you have waiting staff that look as though they may stay for some time, such as if they have bought a house in the area or if they have family in the town, and you are keen to hang on to them, professional development is a great incentive to stay. There are often further education courses, business development training or industry-specific courses available through your local Business Link or college, with many of the related expenses either heavily subsidised or tax deductible. Talk to your waiting staff to see what type of course or additional professional development would be interesting and motivating to them – then use these additional skills to boost your business.